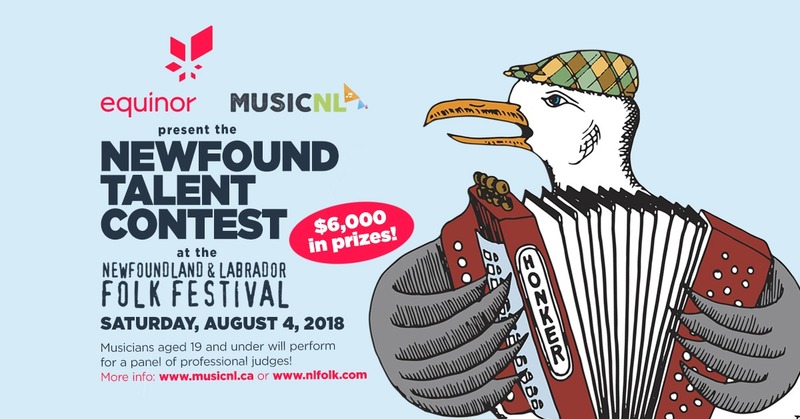 The Equinor and MusicNL NewFound Talent Contest is coming back to the 42nd Annual Newfoundland & Labrador Folk Festival in Bannerman Park for a fifth year. This competition is designed to discover, develop, encourage and showcase young entertainers – offering professional development prizes valued at over $6,000 for talented young performers in songwriting, performing and music business skills. Sunday Night the first place winner of the contest will perform on the festival’s TD Main Stage with some of the world’s finest performers in front of the grand Newfoundland & Labrador Folk Festival audience. Young musicians aged 19 and under will perform for a panel of professional judges and an audience on August 4th. The contest will take place on the TD Neil Murray Stage for youth performers. It’s your time to shine! Applying for the contest by visiting the website: https://marcatoapp.com/forms/musicnl/2018equinormusicnlnewfoundtalentcontest. Full contest details can be found at musicnl.ca!